Tackling the death penalty in Asia. Three ways Australia could take a leadership role on the issue of the death penalty in the region. Two young Australians – Myuran Sukumaran and Andrew Chan – are on death row courtesy of an Indonesian President who appears to care more for populism than human rights and conscience. Their plight highlights the fact that the death penalty, which is nothing short of state sanctioned murder, is a scourge on the Asia-Pacific region and that Australia must do more to ensure that it is eradicated from the statute books of countries like Indonesia, Singapore and Malaysia. It is 29 years since the Malaysian government hanged two Australians, Kevin Barlow and Brian Chambers. It is nearly ten years since a young man from Melbourne, Van Nguyen, was similarly executed by the Singaporean government. In each of these cases, as in the current cases of Sukumaran and Chan, there has been a flurry of legal and diplomatic activity. Politicians made eloquent pleas on behalf of the petrified souls sitting in miserable jail cells and Australian lawyers worked tirelessly with their local counterparts to try for a last chance change of mind on the part of the government. Once these appalling executions occur there is a time of reflection and sadness but the diplomatic caravan moves on and it is the families and friends of those Australians executed by the state who are left to grieve forever more. PHOTO: Jeroen Mirck on Flickr. Surely Australia, as a nation which does not sanction use of the death penalty, ought to take a leadership role in the region? Understanding that the laws of each country are a matter for the people and their elected representatives in those jurisdictions, Australia can and should seek to end this craven lust for revenge that characterises drugs policy in so many Asian countries. There are three initiatives that Australia could embark upon immediately. Firstly, and this is particularly relevant in the case of Chan and Sukumaran, Australian police forces should be prohibited from knowingly or recklessly allowing Australians to travel to jurisdictions where the death penalty may result if they are convicted of drug trafficking. 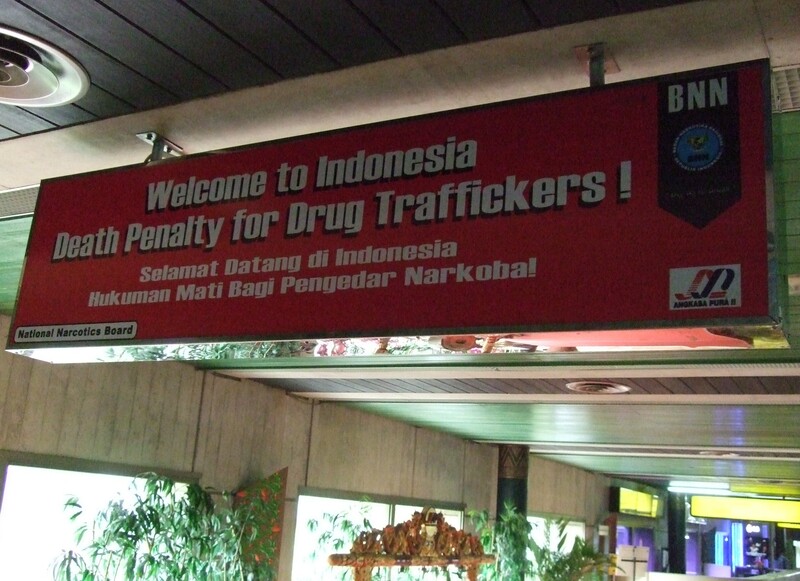 The Australian Federal Police allowed Chan and others who were arrested with him in 2005 to go to Indonesia and execute a drug deal when it had the capability to arrest them in Australia. The AFP did so in the full knowledge that Chan, Sukumaran and others could be executed by the Indonesian authorities. This was a callous act from a police force in a democratic country. Furthermore, Australian police authorities should not share intelligence about drug trafficking operations with nations where to do so would put Australian citizens at risk of the death penalty. No amount of drug trafficking justifies the taking of a human life by the state. Secondly, it is time that Australia and other countries in the region recognise the simple fact that the death penalty is not and never has been a deterrent against the distribution of illicit drugs. The disastrous policy of prohibition means that the risk reward equation for citizens in Asian countries, including Australia, is always skewed in favour of risk. No amount of policing or threats of draconian penalties will deter a participant in a market where the profit margins are so high courtesy of prohibition. For example, opium poppy production in South East Asia has grown so fast since 2008 that the region now produces almost 20 per cent of the global heroin supply. It is time for Australia to look at the regional initiatives of the Latin American region in relation to drugs. Tired of the large scale loss of life caused by drug wars countries such as Columbia, Bolivia, Guatemala, Uruguay and Mexico are looking at some liberalising of drug laws along with a more intense focus on health and lifestyle issues that are associated with illicit drug use. Finally, surely a nation like Australia that believes the death penalty is abhorrent should immediately use its not inconsiderable economic leverage in the Asia-Pacific region to make the point to leaders such as Indonesia’s President Joko ‘Jokowi’ Widodo that if he insists of executing Australian citizens his fragile economy should suffer. Australia, admirably led by former Prime Minister Malcolm Fraser, led the charge in imposing sanctions on apartheid South Africa in the 1970s and 1980s. These sanctions reflected Australia’s disgust at the activities of the racist South African state. Human rights were placed before economic advantage. Such leadership is required in relation to Indonesia. Trade sanctions on Indonesia on a long term basis ought to be considered by the Australian government. President Jokowi must understand there is a price to pay for his pursuit of state sanctioned murder against Australians. This message must be delivered immediately to Jakarta. As a father, law abiding and hard working productive member of society I applaud counties like Indonesia, China and America to be the true leaders and have the death penalty, although my opinion on how and when to execute may differ from the slow moving process in the USA. It escapes my logic that the old, worn out argument about deterrence never dies. The death penalty has never been, nor will it ever be used as a deterrent BUT as a punishment for a crime committed. If, as an additional bonus, another person will NOT commit a crime because he/she is realizing the consequences, this is just fine with me. And there are fail-proof methods to avoid the execution of an innocent person, but this is a to be explained another time. PS. By the way, it was a smart move by the police to leave the drug trafficker leave Australia first so this fine country wouldn’t be burdened with the trial and execution cost. Greg Barns is a barrister and a spokesman for the Australian Lawyers Alliance. He practices in the areas of criminal and administrative law and is the author of three books on Australian politics. He is a weekly columnist for the Hobart Mercury and was a senior political adviser to a number of Liberal Premiers and a federal Minister from 1989-1999.